https://apis.google.com/js/plusone.js Fall is here and along with the cooler weather comes fall harvest. One of our favorite vegetables for this time of year is fall squash and the best and biggest fall squash is pumpkin. 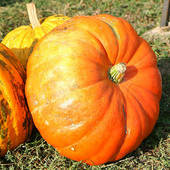 Pumpkin is a delicious low calorie vegetable full of antioxidants and vitamins. Below are a few of my favorite pumpkin recipes. Heat the oil in a large skillet over medium heat. Cook the pumpkin in the heated oil 2 to 3 minutes. Stir in the vegetable stock, cumin, salt, pepper, coriander, red pepper, cayenne pepper and white pepper. Cook until the pumpkin cubes are easily pierced through with a fork, 5 to 7 minutes. Add black beans to the pumpkin mixture. Fill warm tortillas with pumpkin; top with tomato, onion, avocado, and cilantro as desired. Combine flour and salt in bowl. Blend oil and milk in bowl. Add to flour mixture. Stir with fork until forms large clumps. Press into ball. Flatten to form 5-6 inch “pancake”. Roll between sheets of wax paper. Peel off top sheet. Flip into 9 inch pie pan. Remove other sheet. Press dough into pie plate. Trim and flute. Refrigerate until ready to use. Position rack in lower third of oven; preheat to 425°F. Coat a 9-inch pie pan with cooking spray. Make pie crust as directed. Roll out the dough on a lightly floured surface into an 11-inch circle. Drape the dough over the rolling pin and fit it into the prepared pie pan. Trim the pastry, fold the edges under and flute. Place the pie pan on a baking sheet. Whisk sugar, cinnamon, nutmeg and salt in a large bowl. Add eggs and egg whites; whisk until well blended. Add pumpkin, whisking until smooth. Whisk in milk and vanilla. Pour the filling into the crust. Bake the pie for 10 minutes. Cover the edges with strips of foil to prevent overbrowning. Reduce oven temperature to 325°; bake until the center barely jiggles when the pan is tapped, 55 to 60 minutes more. Transfer to a wire rack and let cool. Buckeroomama, glad you found these recipes helpful! You'll have to let me know how they turn out for you.